In recent years, a growing number of Ohio farms have invested in photovoltaic (PV) solar systems to generate electricity to power their farm operations. While PV solar systems are widely recognized for their environmental benefits and the potential to generate electricity on-site to power individual buildings, "this growing sector for green energy presents various worker health and safety hazards in the installation and maintenance of solar energy systems" (U.S. Department of Labor, 2015). During the project development, farmers normally analyze the economics and system production data in great detail; however, there is typically very little discussion on the safety considerations for a PV solar system. According to a report developed by The Fire Protection Research Foundation, "the benefits of harnessing solar energy often outweigh the barriers, yet solar power systems are introducing new and unexpected hazards to fire fighters and other emergency responders" (Grant and United States, 2013). The primary objective of this fact sheet is to provide farmers (system owners) with information to better understand how these systems operate and with resources to develop an emergency response plan for PV solar systems installed on their farms. What is different about a PV solar system? There are numerous differences between a farm with standard electrical service from a utility provider and a farm that has an on-site PV solar system responsible for generating electricity to power the farm. When exposed to light, a grid-tied PV solar system will generate direct current (DC) electric that is converted to alternating current (AC) electricity by an inverter. From this point, the electricity from the PV system is used to power the electric load at the farm facility, while any excess electricity feeds back to the local distribution grid. 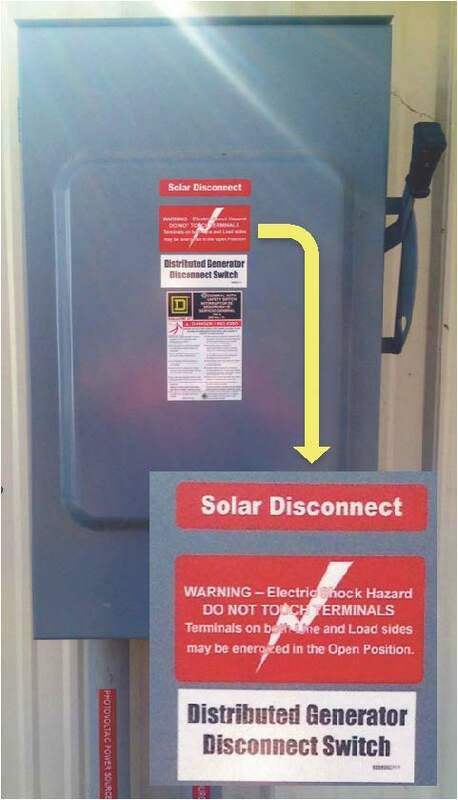 While there are a variety of PV solar system designs and equipment components that make each system unique, disconnect switches (Figure 1) are required to help isolate the energized components of a system. However, even with the disconnect switch(es) off, there's no easy way to shut off the PV panels. "The inability to power-down photovoltaic panels exposed to sunlight makes this an obvious hazard during the daytime, but it is also a potential concern at nighttime for systems equipped with battery storage" (Grant and United States, 2013). Simply put, when exposed to light, the panels will generate electricity, energizing the system's DC wiring and the system components between the panel and the DC disconnect switch. It is difficult to quantify the potential danger of a PV solar system because it depends on the application and system design. "Early PV systems often had maximum system voltages less than 50Vdc, but 600Vdc systems are now common, and 1,000Vdc systems are allowed by code in commercial and large-scale installations" (Haney and Burstein, 2013). 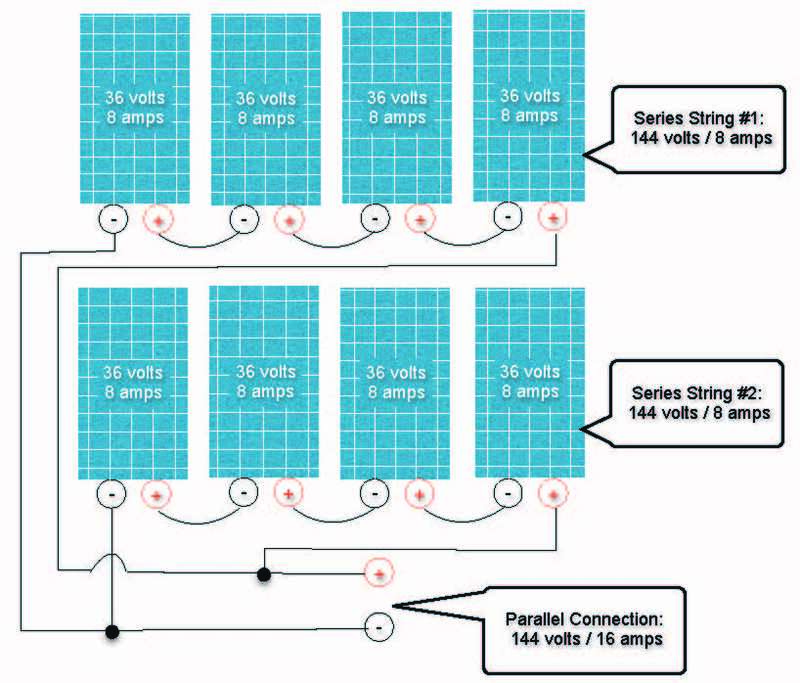 Most systems will include a number of solar panels wired in series strings to increase the voltage, and then the strings will be wired in parallel, which will increase the amperage (Figure 2). In summary, the danger of electrical shock to individual system owners, firefighters or emergency responders who come into contact with a damaged PV solar system is real, with the potential to be fatal and should be taken seriously. In response to this safety concern, Article 690.12 of the 2014 National Electric Code (NEC) outlines rapid shutdown standards for PV solar systems on buildings. In general terms, the Section 690.12 Rapid Shutdown of PV Systems on Buildings requires that energized conductors (AC or DC) can be de-energized on demand, limiting the energized portion of the conductors to not extend more that 10 feet from the PV array or more than 5 feet within a building. Ohio adopted the 2014 NEC for commercial applications effective January 1, 2015, and residential applications effective February 8, 2016. A key element to safely maintaining the PV system is following the manufacturer's recommended inspection schedule. Typically, inspections involve an annual general site inspection and a detailed visual inspection conducted on a regular basis, especially after severe storms. Limit all access points to authorized individuals. Keep access doors closed. Minimize access to fixed ladders. Keep access gates and control rooms locked. Provide signage that states "Authorized Personnel Only" and "Danger: High-Voltage Electrical Area" to warn others of potential hazards. Be aware of any slip, trip or fall possibilities around the system. This could include slipping on wet surfaces, tripping over control boxes and wiring conduit, or falling off the roof when doing maintenance to the system. Good housekeeping practices such as removing any leaves or debris and limiting vegetation growth can also reduce the chance of slip, trip or fall injuries. Lockout/tagout procedures are designed to ensure that safe work practices are followed whenever systems are de-energized prior to servicing. Follow the manufacturer's suggested lockout/tagout procedures step-by-step. Locks placed on equipment during servicing should be removed only by the original person that placed them. Once service is complete and locks are ready to remove, ensure all safety protocols are followed when re-energizing equipment. All individuals working on or around PV systems should be trained to recognize potential hazards. This is critical to selecting the proper PPE for the task at hand. PPE is designed to minimize exposure to system hazards. PPE needed when working with a PV system may include fall protection, fire-rated clothing, arc flash protection, hot gloves, protective eyewear and safety footwear. Emergencies could include fire, lightning strike, wind damage, arc flash or traumatic injury. Roof collapse due to extreme snow loads can also be considered if solar panels are mounted on a building roof. Create a map or diagram of the system. This map should include locations of rooftop or ground panels, clearly marked electrical disconnects and any system panels, conduit, combiner boxes, or inverters. Any additional system information should be located in this section of the plan. Identify key personnel and provide instructions for specific tasks to be completed in an emergency. Also include emergency evacuation and medical emergency procedures. List procedures to isolate and shut down the system as much as possible. This will include lockout/tagout procedures for all disconnects and any stored energy. This will start with a list of emergency contacts such as fire, police, hospitals, electric provider/cooperative, solar system contractor, and any additional expertise or necessary contacts. List critical materials or equipment that should be on-site such as first aid kits, fire extinguishers, ladders, lockout/tagout kit and tools needed. Also, identify any specialty equipment or resources within the community that could be utilized during an emergency such as mobile lifts, bucket truck, electrical supplies and emergency lighting. The emergency response plan should be reviewed annually and all personnel working around the PV system should be trained on emergency response procedures. Provide a copy of the emergency plan to the local fire department and/or emergency responders. It is also beneficial to invite local emergency responders for a site visit to become familiar with the solar power system, shut down procedures, potential hazards and emergency procedures. In order for first responders to effectively respond to an emergency involving a solar power system, there are key elements that must be considered to keep emergency personnel safe. Since most solar PV systems cannot be completely shut down, emergency responders should treat all wiring and solar panel components as if they are electrically energized at all times. To avoid exposing fire personnel to uncertain electrical hazards, fire departments may proceed with a defensive fire fighting strategy. Additionally, large solar panels on a roof can increase flame spread and create large areas on the roof to be shielded from water and hinder fire fighting measures. The fire department may reconsider an aggressive fire attack on rooftops or entering the building and transition to a remote exterior attack and protect surrounding exposures or buildings. Developing a PV solar system to generate electricity for your farm is exciting and can provide a number of benefits. However, "solar power systems are introducing new and unexpected hazards to fire fighters and other emergency responders" (Grant and United States, 2013). It is essential that system owners finish the development process by researching how their PV solar system works and developing a site-specific emergency response plan. Communicate the emergency plan and procedures for your PV solar system with local fire and rescue responders to better prepare for potential emergency situations. This fact sheet is intended as an introduction and does not cover all of the variations in technology, equipment or system design techniques that are currently available for installation. To better understand the details of your system, refer to the system engineering design and the equipment manufacturer's specifications. The intent of this publication is not to discourage you from installing a solar system, but to make you aware how the systems work and to better prepare you in the unfortunate event of an emergency. When in doubt, always assume the components and wiring of a PV solar electric system are electrically energized, stay away from a damaged PV solar system, and contact trained professionals to respond, remediate and repair the system. Grant, C. C., and United States. (2013). Fire Fighter Safety and Emergency Response for Solar Power Systems. Quincy, MA: The Fire Protection Research Foundation. Haney, J., and A. Burstein. (2013). PV System Operations and Maintenance Fundamentals. Solar America Board for Codes and Standards. National Fire Protection Association. (2013). National Electrical Code, NFPA 70. Article 690. Quincy, MA: National Fire Protection Association. Tidwell, J., and J. J. Murphy. (2010). Bridging the Gap: Fire Safety and Green Buildings. Washington, DC: National Association of State Fire Marshals. U.S. Department of Labor. (2015). Green Job Hazards: Solar Energy. Retrieved April 21, 2015 from Occupational Safety and Health Administration (OSHA): osha.gov/dep/greenjobs/solar.html.